I'm a self admitted yarn snob. I love silks and wools... I'd go into the studio and roll around in a pile of them on the floor... but I digress. 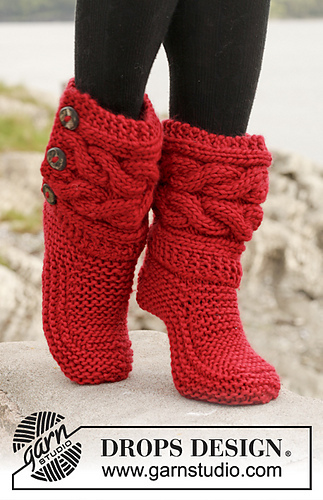 For Slippers - the cushiest, squishiest wools are not very durable, and therefore are not very practical either. In the interest of slipper preservation, I decided that this was one of those times where the "fancy schmancy" yarn really wasn't going to give me the best finished product in the end. Ever wonder why our Grandmas knit slippers from that Plasticy Phentex stuff? It was INDESTRUCTABLE! (albeit, likely flammable, ugh, wearing near a wood stove? melty-hot toes!) I think I still have the pair from 10 years ago around here somewhere. The old plastic Phentex yarn was basically just a rough acrylic, but intended for really hard wearing uses, like on our feet, or in a tough blanket. So I wanted something in between! Some of the squish and comfort of a real wool, but some of the hardwearing and practical qualities of an acrylic yarn... Bring on the Wool Blend! 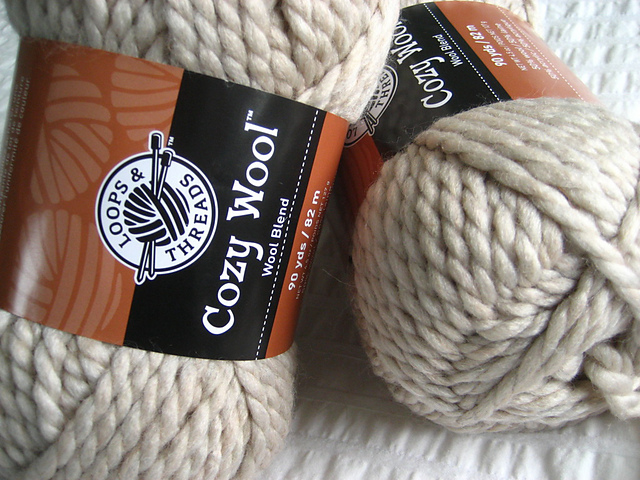 - Purchased at Micheals... this 50% Wool / 50% Acrylic Blend yarn should do the trick! - It comes in lots of delightful colors, and in a 127g ball - I'm hoping it goes pretty far. There are half a dozen different designs all featuring the same thing: Chunky, squishy yarns. Oversized, almost Ugg-ish Slipper Boots. They look warm and super comfortable. I've honestly been looking for a reason to make a pair for months now, and had been avoiding the yarn section at Michaels because I need more yarn like a hole in the head knew I couldn't resist! to modify one of the Drops Patterns to make it Whovian enough to work. I really like the shape of the foot on the "150-4 Little Red Riding Slippers"... so I think I'm going to start there and then see if instead of the cabled ankles, try and add a grid reminiscent of Tardis windows and add some kind of custom buttons to Doctor it Up. It's winter in Canada. Read: Snowy and dark short days a lot of the time. Of course, this is kind of a bummer, but it's temporary for a few months. Things will get better. 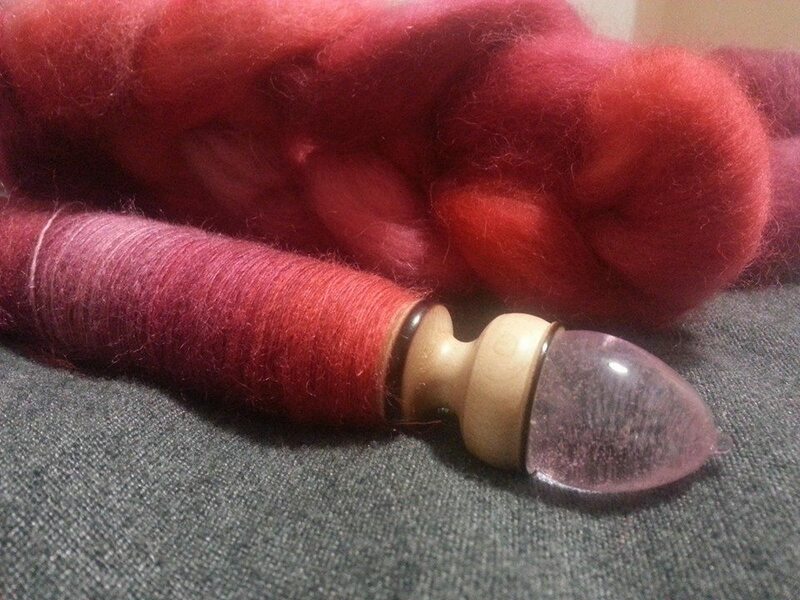 Above you see my "Outlander" Bristlecone Glindle... complete with Scottish Thistle and lavender glass focal... robed in a lovely Strawberry Red BFL Handpainted Top from Lofty Fibers. It's my first experience with this dyer, and I'm loving it so far. There were a few small felted sections in the first bit of the fiber, but after that it's been smooth sailing. This one was a gift from a friend for Christmas, and it's so berry red, you can almost smell summerfresh strawberries. The plan is to divide the whole braid in half (two identical but thinner tops) and spin them as is and make a laceweight 2-ply. I don't know what I'll make - but I do know I've been craving strawberries for an entire month now. Any idea why?